Adam Michael has this to say “This Bulgarian rose absolute is very different in aroma profile from the dewy pink petal goodness of our Rose Absolute Pink Supreme. Instead this material goes more in a velvety red rose direction. Warm, spicy-floral, very rich, indulgent, full blown red roses and ever so slightly honey sweet. The power of this rose absolute is insanely good, always so rich and fulsome, always red rose floral, and underpinned with delicate spice nuances throughout. 18 hours on the smelling strip, fire red in colour, of a pourable viscosity and of course produced by solvent extraction of the Bulgarian rose petals. 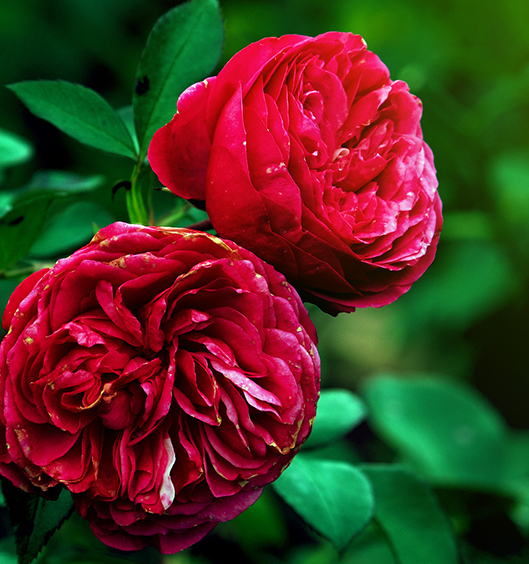 An old story about roses involving the ancient Hindu legend and supposed creator of the world, Brahma. It is said that Brahma and Vishnu (the protector of the world) argued over whether the lotus was more beautiful than the rose. Vishnu backed the rose, while Brahma supported the lotus. But Brahma had never seen a rose before and when he did he immediately recanted. As a reward Brahma created a bride for Vishnu and called her Lakshmi – she was created from 108 large and 1008 small rose petals.